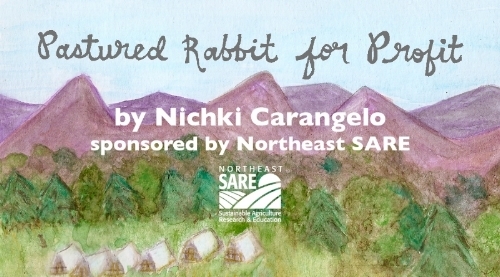 Nichki Carangelo, of the delightful Hudson Valley-based, cooperative Letterbox Farm Collective, has just finished a publication on the commercial production of pasture rabbits. Funded by a SARE grant, “Pasture Rabbit for Profit” is an easily digestible, practical resource for farmers intended to guide readers through the start-up phase of their own pasture-based rabbitry. It includes a full enterprise budget along with housing plans, sample breeding schedules, feed guidelines and other rabbit husbandry basics. And it’s available for free download here!